on A4-sized Khadi paper. Collection: Maitland Regional Art Gallery, NSW. Although Waite's crazy, hallucinogenic lyric draws word pictures that are worthy of Magritte, I haven't attempted to illustrate the song. My work is drawn from the mental picture that was summoned like a genie from a bottle the first time I played the song. 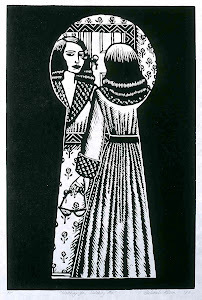 The stiff necked protagonist’s starched collar and tightly buttoned dress recall the pleasure-shunning Puritans. Her "bonnet", however, takes the form of a piano. This is a Puritan in denial; despite herself, it seems she is more in tune with the drunken piano. 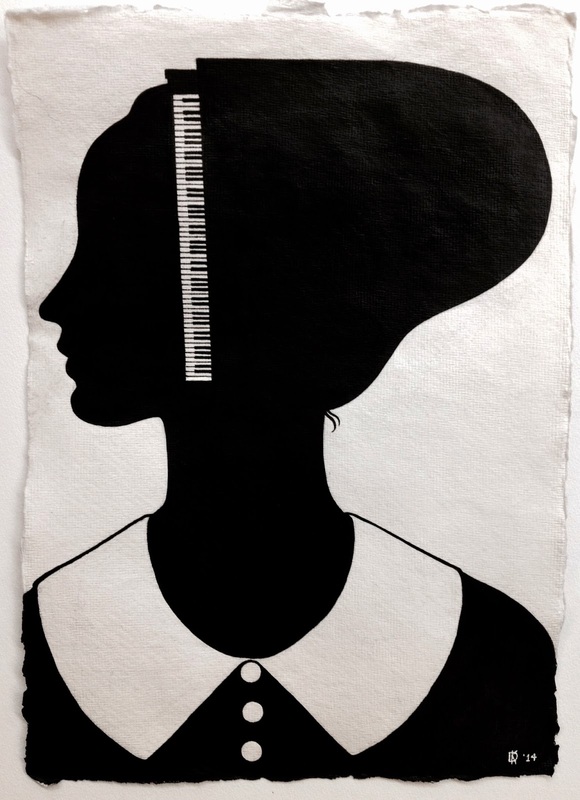 The Piano Has Been Drinking (Not Me) is one of eight works on paper exhibitions at MRAG, collectively titled JUST PAPER, that will run concurrently between 2 May and 22 June. For full details, go HERE. 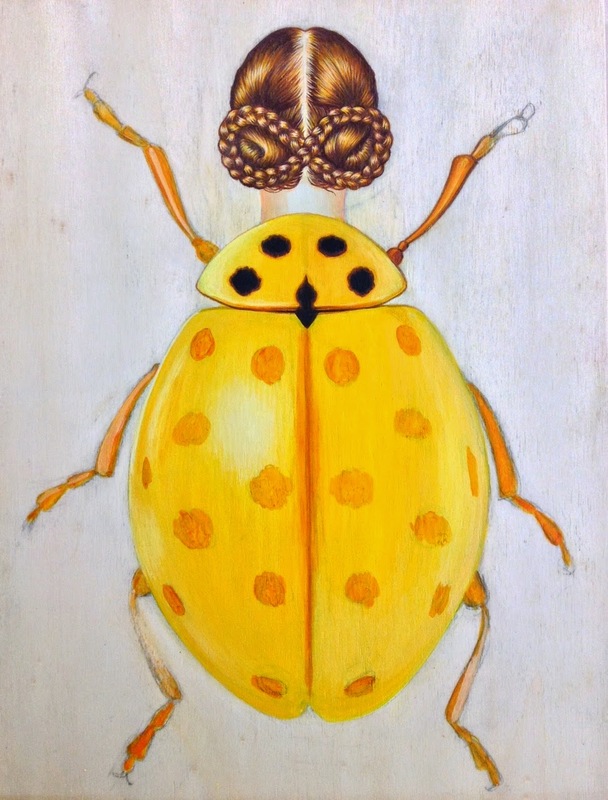 Pictured above: 22-Spot Ladybird Woman (Psyllobora vigntiduopunctata Homo-insecta) 2015, acrylic on wood, 32 x 23 cm. (Artist’s impression). To date, the exact measurements of this recently discovered Homo-insecta are unknown. Based on numerous eyewitness accounts, she is approximately 26 cm in length (even taller when she lets her hair down) x 13.5 cm in width. Miniscule by comparison, the European insect from which she evolved, Psyllobora vigntiduopunctata (abbr. Psyllobora 22-punctata) measures a mere 3-5 mm. Pictured below (and also previous 2 blog posts): selected views of the documentation process. 22-Spot Ladybird Woman: gradually taking on colour and almost ready for her spots. Pictured above: more developmental views of 22-Spot Ladybird Woman, 2015, pencil, gesso and acrylic on wood, 32 x 23 cm (see also previous post). 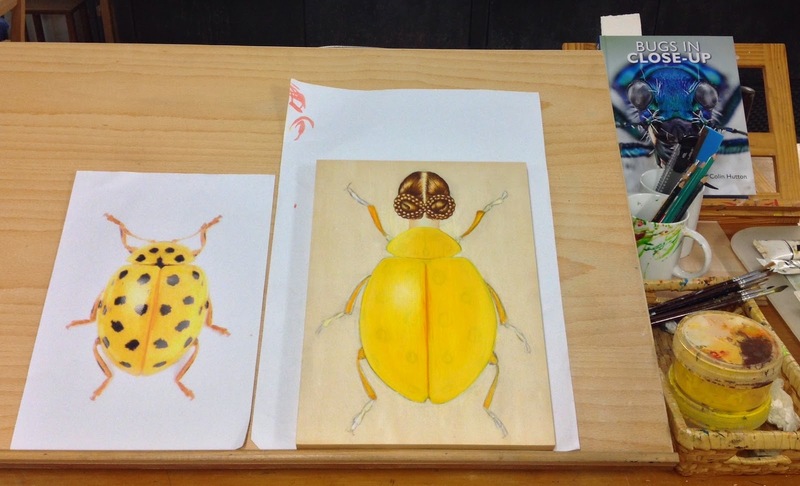 Beginnings of a new painting: 22-Spot Ladybird Woman (Psyllobora viginitiduopunctata Homo-insecta) pencil on wood (top image); pencil and gesso on wood (bottom image) 32 x 23 cm. 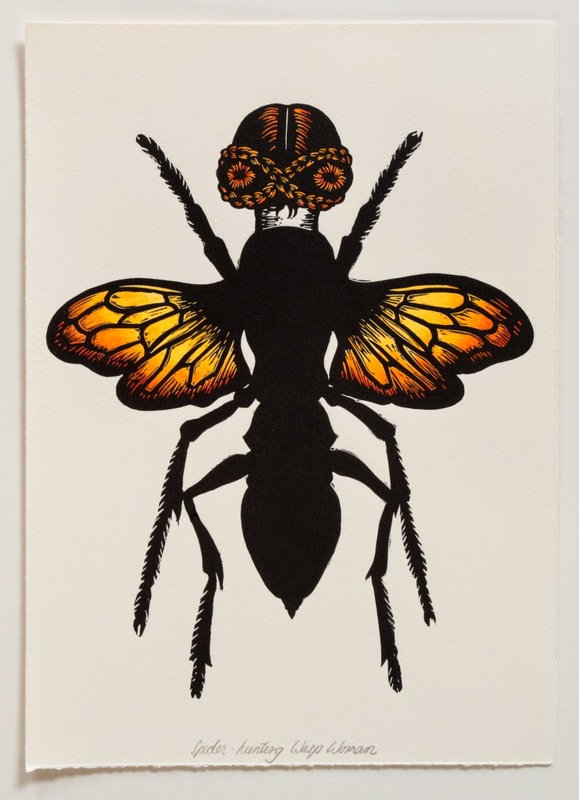 True to their conviction that it's well and truly time for a change, the Moth Woman Vigilantes have also commissioned a 2015 Republic of Mothstralia 55c stamp. (See also previous post, Monday, April 6). Ever the optimist, I’m still imagining and imaging a brave new order in which the Moth Woman Vigilantes* take us under their collective wing. (It couldn’t be any worse than what we have now). Step 1: Designing new sets of Mothstralian postage stamps, the first of which is previewed here. The "stamps" were constructed by combining my artwork with the iPad apps Face on Stamps, Square Ready and Strip Design. (*Notorious fighters for freedom, equality and social justice, whose true identities have never been uncovered. See also: Blog Post March 8, 2013). 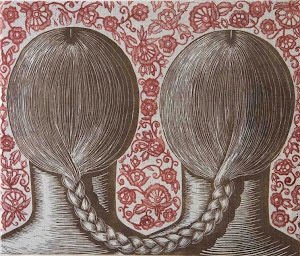 Editions (Redux) currently showing at Tacit Contemporary Art, is essentially a reduced version of Editions 2015, the gallery's recent exhibition of Victoria-based printmakers that featured eight of my linocuts (see Blog Post Saturday, February 21). Spider Hunting Wasp Woman (pictured above) is one of six Homo-insecta making a return appearance. T. J. Bateston, Louise Donovan, Kevin Foley, Peter Garnick, Ying Huang, Kyoko Imazu, Hyun Ju Kim, Deborah Klein, Damon Kowarsky, Kir Larwill, Marion Manifold, Soula Mantalvanos, Stephanie Jane Rampton, Trudy Rice and Joel Wolter. Editions (Redux) is curated by Keith Lawrence. The exhibition runs until 12 April.